“To carouse on the eve of one’s nuptials strikes me as highly illogical” said the decorated Vulcan. My commanding officer, Captain Kirk, wanted me to have a woman jump out of a cake.That is an illogical waste of a cake. The physics of having a woman jump out of a cake imply that the cake is hollow. Why buy a cake that is hollow? You would not be able to eat it. Also any woman who jumps out of a cake would have to be very, very short. Six inches at best. Very illogical. Kirk said I was missing the entire point and that the cake would be large and not really a cake but a decoration that looks like a cake and the woman who jumped out would be a stripper. A cake that is not a cake is illogical. And a woman who’s job it is to jump out of cake also is illogical. Why would anyone want to see a woman jump out of a cake? Especially when they were expecting to eat cake. 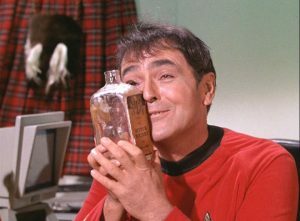 Kirk said “But Spock it’s a tradition at bachelor parties.” Humans have highly illogical traditions I don’t understand. After nixing the idea of a hollow cake Spock then had to deal with Lieutenant commander Scott who brought an unregistered bagpipe to the party. and I thought he was going to expel vomit from his mouth. That quite logically happens when one has imbibed excessively. But this is a social function celebrating an engagement not what humans call a “frat party.” I performed a Vulcan neck pinch on him and we carried him into the bedroom and let him sleep it off. We then burned his bagpipes. Not out of spite but only because it was the logical thing to do. Okay we all hate bagpipes so maybe it was spite but spite can be quite logical. Spock’s logical bachelor party was also threatened by the appearance of Yeoman Rand. are in proportion and conducive to attempts to feel the flesh of her backside. Not that I approve of that behavior mind you. I’m just saying the attempt to squeeze her fleshy backside is very logical. 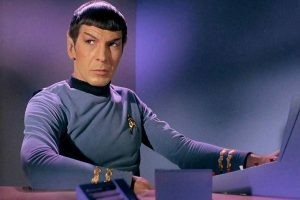 Finally Spock asked his guests if they wanted to partake in some Vulcan meditation. To his dismay they all left.